Proper disposal of electronic data stored on a large format printer’s disk drive is imperative to preventing inadvertent disclosure of sensitive or confidential information. Data-sensitive environments are no longer limited to defense agencies, power generation firms and related contractors, but include any enterprise that places a high value on its intellectual property. These environments require specific security precautions to ensure the security and integrity of sensitive and confidential information. Security breaches can occur when documents are not disposed of properly. This is not only limited to hard copy documents but also electronic data. Unfortunately, simply deleting files isn't enough. Threats to your data and secure information linger long after you delete a file. The disk drive that is part of a large format printing device’s controller is used as a temporary repository for spooling and processing data (e.g. copy, scan and print jobs). These drives are susceptible to data remanence – the residual representation of data that remains even after the data is deleted – which can inadvertently make sensitive data available to unauthorized users. Proper disposal of electronic data stored on a large format printer’s disk drive is imperative to preventing inadvertent disclosure of sensitive or confidential information. To prevent this from happening, specific security precautions should be integrated into all network devices. Purchasing a large format device that is equipped with electronic data shredding (or e-shredding) functionality can help prevent recovery of previously printed, scanned and copied documents. With e-shredding technology, data is overwritten in such a way that makes it impossible to retrieve or reconstruct it. 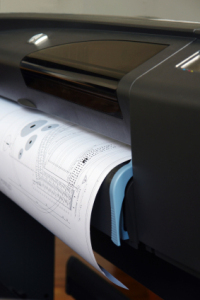 Print, copy and scan jobs sent to a large format print system enabled with this technology are completely overwritten and erased upon completion of the job. This can be particularly useful in decentralized walk-up environments where many different users have unregulated access to the system. Gutmann: All jobs on the system are erased in 35 overwrite passes. An overwrite session consists of a lead-in of four random write patterns, followed by 27 specific patterns executed in a random order, and a lead-out of four more random patterns. US Department of Defense 5220.22-M: This is generally regarded as the highest level standard for sanitization to counter data remanence. It meets U.S. Department of Defense requirements for erasure of disk media. Custom: The system administrator defines the number of overwrite passes manually.